The eligibility is BVSc & AH or BHMS and mode of selection will as per KVASU rules. There would be around 100 seats with a tuition fee of 12000 per semester. The course will be dealing with the basic principles and philosophy of homeopathy, homeopathic pharmacy; repertory ;homeopathic materia medica and practice of homeopathy in veterinary medicine. Decade movement committee set up by the association has produced fruitful results and all credits goes to the team led by Dr.Ravi M Nair. Dr.Ravi M.Nair, Former Advisor, Department of AYUSH, Ministry of Health and family Welfare is known to everybody in the Homoeopathic community. Everybody appreciate him as "A dedicated, homoeopath who renders his life for the development of Homoeopathy. His tireless work also acclaims him as a great organizer, administrator, and perfectionist. The newly formed Kerala Veterinary and Animal Sciences University (KVASU) is located in the scenic hilly terrain of Pookot in Wayanad district, Kerala, India. 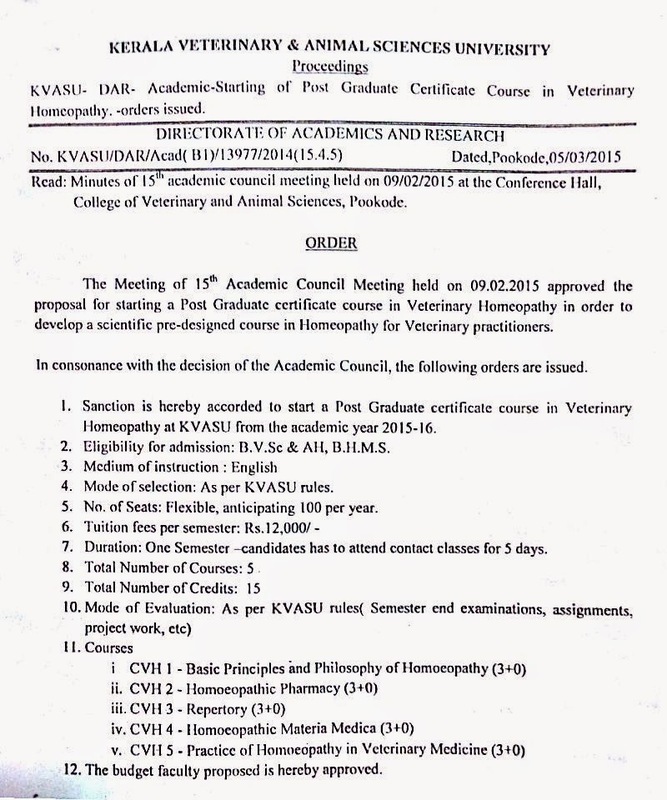 KVASU has three constituent colleges which include: College of Veterinary and Animal Sciences, Mannuthy, Thrissur, College of Veterinary and Animal Sciences, Pookot, Wayanad and College of Dairy Science and Technology, Mannuthy. Moreover the university has research stations at Thumbermuzhi, Thiruvazhamkunnu and Mannuthy. Since this is a newly established university, improvement of infrastructure facilities is of paramount importance. Infrastructure facilities in the areas of education, research, extension, capacity building, IT connectivity, distance learning, Clinical services, diagnostic facilities, zoonoses, animal nutrition, biotechnology, ethnoveterinary medicine, pathobiology, dairy technology and in other related sectors are most essential and are directly linked to rural development. College of Veterinary and Animal Sciences, Mannuthy was established in 1955 and is one of the constituent colleges of the newly established Kerala Veterinary and Animal Sciences University. The College has made extensive contribution for the development of animal husbandry sector of the state. In addition to development of human resources for serving the livestock farmers of the state, the college is also instrumental in various research, extension, consultancy and clinical services besides acting as a source of high quality germplasm and animal products to the farmers and general public respectively. The livestock sector confers an immense contribution to the rural livelihood and food security of the masses. It provides employment to millions of livestock farmers while acting as a supplementary source of income to many agricultural farmers. It is also disproportionately benefits women being the primary animal husbandry activists in rural areas, and therefore, this sector serves a great contribution to economic and social wellbeing of women. Women involvement is more than 80% in this sector. Further, the sector provides valuable nutritional sources to the growing children and working population in the form of milk, meat and eggs. The College of Veterinary & Animal Sciences, Pookot, was formally inaugurated on 11 December 2004. The campus is sprawled over 100 acres in the scenic hilly terrain of Wayanad in Kerala, India. The College offers Under Graduate (BVSc & AH), Post Graduate (MVSc) and Doctoral (PhD) Programmes in Veterinary & Animal Sciences. The resources at COVAS Pookat include: Laboratories, Library, Clinical training, Farm training, Ambulatory clinic, Work experience/ enterpreunership, Student projects, Topic presentations & discussions and Study tours.